If you’re looking for fun cat toys, whether that be a great scratching post or catnip-loaded oddities, you’re in the right place. Cats are very intelligent animals, with 300 million neurons in their brains. That’s around twice the number that dogs have. 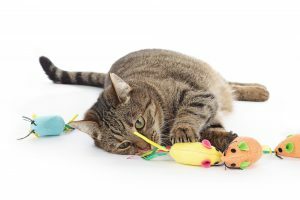 They crave stimuli that keep them mentally engaged, and fun cat toys are one of the best ways to do this. Here are 10 of the best we’ve rounded up for you. Toy boxes are wooden boxes with a number of holes bored into them. Your cat can explore the holes to scoop out their favorite toys, or even a little treat or two. Since the toys are partially hidden, your cat will enjoy ‘hunting’ them out, and receive the reward of playtime once they beat the box. You can give the box a gentle shake as they try to catch the toys to make it more challenging and fun for them. Just like dogs, cats can benefit from dental chew toys to keep their teeth and gums healthy. They can help to remove tartar and come in a range of forms to keep your kitty entertained while they munch. These include ‘wriggle worms’ and chew wheels, which are surprisingly fun cat toys. Plus, all chew toys tend to be very affordable, so they’re worth the very small investment to help prevent dental bills later on. If you’re buying dental chews for kittens, these can help them teeth properly too. From something very low-tech to something very high-tech: Petcube Play is an interactive wi-fi pet camera which allows you to monitor your pet while you’re not in. That’s not all – there’s 2-way audio, so you can have a ‘conversation’ with your furry friend too so they’re not lonely. You can play with them using a built-in laser toy (don’t worry, it’s safe for humans and animals). There are also sound and motion alerts, so it doubles as a security device of sorts. Or it will at least give you a heads-up before you get home if they’ve smashed your favorite vase. Scratching posts are a must have for all cat owners. They give your cat a place to vent their frustration which isn’t your leg or precious wooden furniture. To find the best cat scratching post, look for one that’s durable enough to take daily punishment. You might also consider posts which offer an extra potential activity for playtime – those with a ball on a string attached, for example. Brightly colored balls spinning round and round a multi-level tower. Sounds like cat heaven right? If you have more than one cat they’ll enjoy playing together with this toy, as it offers the opportunity for them to bat the balls back and forth to each other at dizzying speed. These fun cat toys are great for their reflexes and hunting instincts. Not all toys are suitable for little kittens. They’ve got far more energy than the adults, who enjoy a good nap as much as they enjoy a good workout. It’s really important that kittens start life with as much stimulation as possible for good mental health in later life. Dangled objects from ‘fishing rod’ teasers are a favorite – watch them pounce and see if they can catch the lure before you whip it out of their way. Balls with bells inside are another good choice. They’ll love chasing these around the room. Not, strictly speaking, a cat toy. Roombas are automated vacuum and mopping devices for your household. But cats are very curious about them. It’s been well documented by cat owners on Youtube that these can be fun cat toys for those who enjoy a ride-along. If you live in a cold region where your cats stay indoors a lot during winter, it’s still important that they get plenty of exercise. An exercise wheel can help them get what they need, without venturing out into the wind, rain, and snow. This really shouldn’t be a substitute for access to the outdoors in the summer months though. Cats love to explore the neighborhood and meet and greet the neighbors. Unless there’s a good reason to keep them in when it’s warm enough, let them wander where they will. There are a huge number of toys which contain catnip, from cute mice to scratching posts. If your cat reacts to catnip (not all cats do), it doesn’t really matter what the toy is. The plant can either act as a sedative or stimulant, depending on your cat. If it’s a stimulant for your cat, be sure to stock up on other toys for them to burn off all that excess energy on! It might seem like an odd choice for a cat, but soft tunnels can be fun cat toys. This is partially because they can have some privacy when they need it, and partially because they like the challenge of ‘escaping’ from a multi-tunnel arrangement. You can move the tunnels while they’re inside to add to the challenge. This is a good pick if you can’t let them outside, as it offers both mental and physical challenges for them to overcome. We’ve tackled their mental health in this post with a range of fun cat toys. Check out our must-have list for more ideas. But how else can you keep your feline purring with delight – and what about their physical wellbeing? A balanced diet and access to the outdoors are crucial for a healthy and well-adjusted behavior. Learn how to keep them happy by reading our blog, and share your thoughts and personal experiences with other enthusiastic cat owners – and us!